Africa verfertiget von J. G. Schreibern in Leipzig - SCHREIBER, J.G. Title : Africa verfertiget von J. G. Schreibern in Leipzig. Map maker : SCHREIBER, J.G.. Size : 6.5 x 9.5 inches. / 16.5 x 24.1 cm. 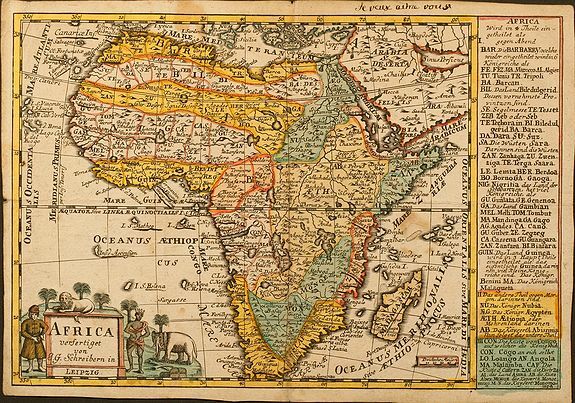 Description :Small scale map of Africa by J. G. Schreiber, from his Atlas Selectus in 1749, first published in 1740. Nice cartouche with elephant, lion and palm trees. Condition : Overall browning, old folding. Tiny hole in centrefold. Some place name underlined by old ink. Good condition.